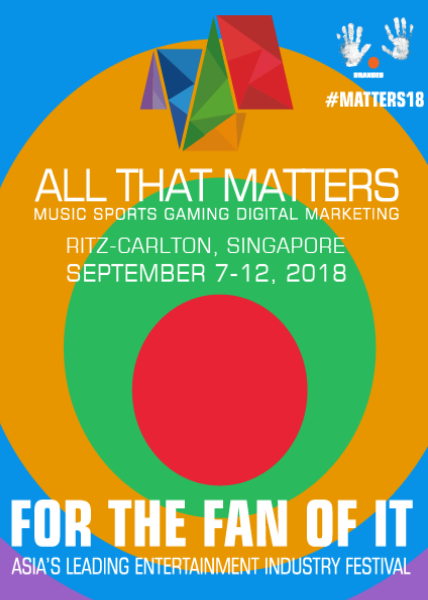 The who’s who in Music, Sports, Gaming, Digital and Marketing are coming to All That Matters, Asia’s leading entertainment industry festival, at the Ritz-Carlton Millenia, Singapore this September. New Speakers: 75% of this year’s programme features new speakers – want to see who’s speaking? Content: With a growing list of speakers at over 150 including 30+ keynotes across 5 tracks in 80+ sessions, it’s a big programme! Networking: Pool parties, lunches, after parties and more time to mingle … who will you meet? Live Music: Who will you discover in 2018? 30 bands, 5 nights, multiple venues …let us entertain you! Featuring AirAsia, Alibaba, Amazon, ASTRO, Cathay Pacific, China Sports Media, CMC Holdings, Empire, ESL, F1, Facebook, FOX Sports, Globe Telecom, Go-Jek, Google, INgrooves, J&J, Live Nation, Lufthansa, Mediacorp, Microsoft, Mission Hills, NBA, Netflix, Ogilvy, ONE Championship, Perform, Philips, PUBG, Riot Games, Spotify, Standard Chartered, Singapore Tourism Board, Telkom Indonesia, Tencent, The Coca-Cola Company, Twitch, Twitter, Ubisoft, Unilever, Universal Music, Viacom, VICE, Warner Music, YouTube and many more. India Matters: Entertainment and media consumption is undergoing a transformation – what does this mean for the music industry? Movers and Shakers: Up close with Ralf Reichert (CEO, ESL), Kevin Lin (Co-founder, Twitch), CH Kim (CEO, PUBG Corporation), Jason Fung (Head of Esports, Alisports), and many other movers and shakers in esports today! Money Matters: Who is making money in gaming and esports today and how? Esports Ecosystem: What does a healthy, sustainable, open ecosystem look like? How can one participate regionally and globally? GenZ Matters / Winning and Building Fans Matters: Finally, what are the next generation doing (or not) with their media habits?